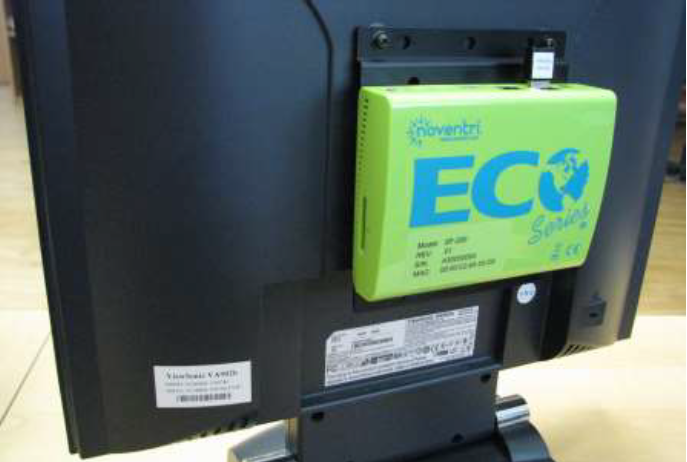 I reviewed the Noventri digital signage products last year, and wrote about how impressed I was after deploying in a manufacturing environment. I’ve since deployed them in several applications (from database driven visitor boards to information displays in manufacturing plants). I recently got my hands a pre-release version of their latest player: the SF-200 and took it for a spin. While the SF-100e was all metal with a very angular design, the new SF-200 has transitioned to polycarbonate and inherited some attractive looking curves in the process. I like to think of it as having transitioned from Humvee to Italian sports car styling. The material is pretty thick and feels like it wouldn’t break if dropped. The DVI connector is replaced by HDMI, Composite Video (CVBS) and Component Video (YPbPr). The latter two are for future use. An Optical Audio Port (S/PDIF) has been added. Also for future use. An SD slot has been added. Also for future use. An IR Remote has been added. Current functionality is limited to reboot and reset to defaults, but will be expanded in the future. For example, on screen network setup via remote is planned to be added shortly. A mounting plate is available for mounting to the back of a monitor with VESA hole patterns. Like its predecessor, the SF-200 is a fluorescent green, solid state device and can be used as a standalone player (Sneaker Net), as part of a LAN, WAN or via the internet. The player is still diminutive in size at 5.1”W x 3.9”D x 1.5”H, can still be buried in a wall without overheating and still consumes 4W. Noventri don’t publish the hardware specs of their players, but I was informed that a hardware video decoder is included in the SF-200, and will be enabled in a future software release. This will allow features such as true alpha dissolves, etc. to be added in incremental, no charge, software updates. I’m glad to hear this, as I do feel that the current dissolve function is very PowerPoint 1.0-esque, so I’ve never used it. Video of up to 1080P. This will be rolled out in stages: full screen, scaled in a zone, files uploaded from Noventri server, player streaming directly from URL’s, etc. There is also a plan for animations and text over video. Although this is some way off, the SF-200 hardware has been designed with features in mind. Version 2.8 of Noventri Suite should be used with this player. Other than having to swap DVI for HDMI, and RSR232 for USB-RS232 (if used) the SF-200 is a straight swap for the SF-100e. Version 2.8 of the software brings many performance optimizations that significantly improve performance. One of the major improvements for database driven systems is ODBC connection pooling. Previously, all SQL Select statements would open their own ODBC connection, even if connecting to the same database. For example the following would result in three separate ODBC connections. With the new ODBC Connection Pooling, the software looks for queries against the same database and groups them all into one connection. (In the above example, only one connection would be used.) This technique reduces connections and authentications to the database, reducing network traffic, and significantly reducing the time to retrieve the content and display it on screen. Another welcome feature is automatic updates of Noventri Suite (client design application) from the server. When connecting to the server, it will detect if it is running a later version than the client. If so, the user will be offered the opportunity to download the upgrade. If they choose to update, the installer is automatically downloaded from the Server and installed on the PC. This feature is especially helpful for large digital signage networks with many different users/departments connecting to a server. Not only does this make it easier for the users, but it also gives the network administrator control over which version users are running when they are connecting to the server. The player still retails for the same price as the SF-100e ($599) and a trade-in program is planned for users wishing to upgrade. As mentioned early, with the exception of changing a few physical connections, the SF-200 is a straight physical swap for the SF-100e. To test, I took one of my 1080P True Color projects with a number of large images, opened it in 2.8 and deployed it to the SF-200. The first thing that leaps out you is the update time. This project took an average of 2m20s to update on my SF-100e, on the SF-200, it took seconds: the progress indicator flashed on 12% briefly and then went straight to 100%. I spoke to Noventri’s President, David Linetsky, about the performance and he said “Our first goal for this player was to release it as a replacement for the SF-100, so the functionality on release is very similar, except its much faster and more stable. Everything is in True Color. You will see a great difference using database driven projects, incredibly fast content downloads and page rotations. Manufacturing operations are a large number of our clients, so we wanted the player to be enhanced for them out of the box. In real world testing, where the network is not a bottleneck, a very large project that would take the SF-100e almost 60 minutes to download, downloads to the SF-200 in just over two minutes.” David also shared a picture of their test network, where they are able to a test a network of over 200 players. I like to call the “Noventri tree”. On the outside, the SF-200 appears to be a cosmetic make-over with some future interfaces added, but under the hood, the engine has been upgraded to a V12 and few turbochargers have been added. My test player performed perfectly with v2.8 and I was amazed by the improvements in performance. Having use the Noventri products for several projects, I reiterate the conclusion from my previous articles: bang for the buck with Noventri is amazing. I’ve used several much pricier products that don’t come close to Noventri, especially when integration to SQL data sources is required. While the world of digital signage has charged headlong into the cloud, with barely a thought for users who need secure access to local data sources, Noventri has kept its feet firmly planted on the ground (but still embracing the cloud), by producing a solid, easy to use, and easy to integrate product for wide range of markets.